The Weinsteins Are Remaking “Seven Samurai” Plus They Have Found Their Director To Take On The Job!!! The Brothers Weinstein have tapped into remaking yet another classic. This time it is the beloved Akira Kurosawa masterpiece “Seven Samurai” according to Variety. Seven Samurai was a huge inspiration for several later films including “The Magnificent Seven”. It seems that along with the Weinsteins, the Japanese Kurosawa production people will be producing the film as well. 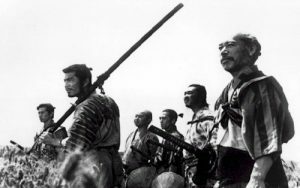 But, it looks like this remake of “Seven Samurai” won’t feature any samurais at all and will be a modern tale of the original. The writer of Young Guns, John Fusco has been hired to pen the script which he has been writing and fine tuning for over a year now. Best Picture Winner, “The King’s Speech” Is Getting Edited Down For A PG-13 Rating!!! The Weinstein Company and Miramax Will Team Up to Make a Few Sequels!! Find Out Which Ones!!! This entry was posted on Tuesday, May 3rd, 2011 at 10:06 pm	and is filed under Film, News. You can follow any responses to this entry through the RSS 2.0 feed. You can skip to the end and leave a response. Pinging is currently not allowed.